Dunedin, FL., November 11, 2017 – There’s no doubt that’s it’s a tough feat to bring a group together in unison to win a championship. For the Suncoast Suns, they’re hoping to keep the band together a little bit longer after the 55+ National tournament results. Suncoast pitcher Jim Kearschner pitched a complete game, striking out six batters en route to the Suns defeating thePuerto Rico Athleticos 5-2 at Florida Auto Exchange Stadium on Saturday morning. 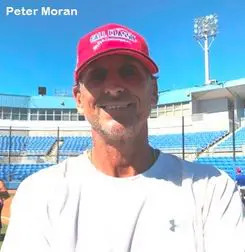 Suns manager Peter Moran’s wishes to his championship winning group afterwards was to vow to return and defend their title. From the get go, Kearschner was able to get a read on the Athleticos’ lineup and located his pitchers early and often. The right-hander struck out three in the first three frames and got several players to hit ground balls. Most of Kearschner’s outs were on ground balls that developed into double play situations. The Suns got their bats heated up in the top of the third inning and were able to tag Puerto Rico starter Antonio Pabon for four runs in the inning. By the end of the top end of the inning, Suncoast entered the fourth armed with a 4-0 lead and Kearschner had all the confidence he needed for the rest of the contest. Dan Cuff’s double in the third inning helped get the scoring going for the Suns. Suncoast avenged an early tournament loss to Puerto Rico and was able to turn the tables and win when it mattered most. Jose Castillo’s group didn’t go down quietly, however, and in the bottom of the ninth inning made things somewhat interesting. With Kearschner looking to pitch a complete game shutout, the Athleticos avoided the shutout and posted two runs on the board before a fielder’s choice by Alfredo Batista effectively ended the game. The goal for Moran and the Suns are hoping to be in the same position again next season, with the team’s manager telling his players right after the game that he wants the club back intact.